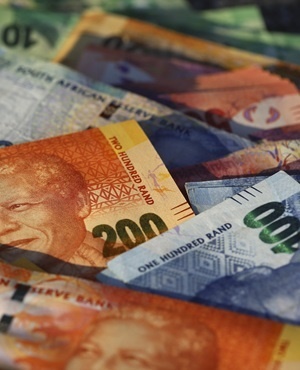 The fortunes of Lesotho, Namibia, and Eswatini - formerly known as Swaziland - are beholden to developments in their larger neighbour with their exchange rates pegged to the rand, the worst-performing major currency against the dollar this year. The three nations, together with Botswana, also derive revenue from a customs-sharing pool that gains and falls on South African trade. The continent’s most-industrialized country is struggling through a recession, but the central bank is hamstrung in cutting its key rate from 6.5% as it strains to contain inflation spurred by higher oil costs and a 13% drop in the rand versus the dollar. Receipts from the 108-year-old Southern African Customs Union - the world’s oldest such arrangement - account for about 40% of government revenue for Lesotho and Eswatini, and about 30% for Namibia and Botswana. South Africa has paid an average of almost R50bn ($3.5bn) to the pool in each of the past four fiscal years. South Africa’s National Treasury has reduced its estimates for payments to SACU this fiscal year and next, and there is “material downside risk to these forecasts” because the economy isn’t expanding as much as first predicted, said Mamello Matikinca-Ngwenya, the chief economist at FirstRand Ltd’s First National Bank retail-lending unit. While Namibia has a developed mining industry, the country - bigger than France by land area - has a population of just 2.6 million people. Botswana is Africa’s largest producer of diamonds, income that has helped it progress into one of the continent’s most wealthy per capita.